Interested in real estate investing? Jason Kogok will be presenting a one day seminar at NCSU’s McKimmon Center for Extension and Continuing Education, on January 28, 2019. 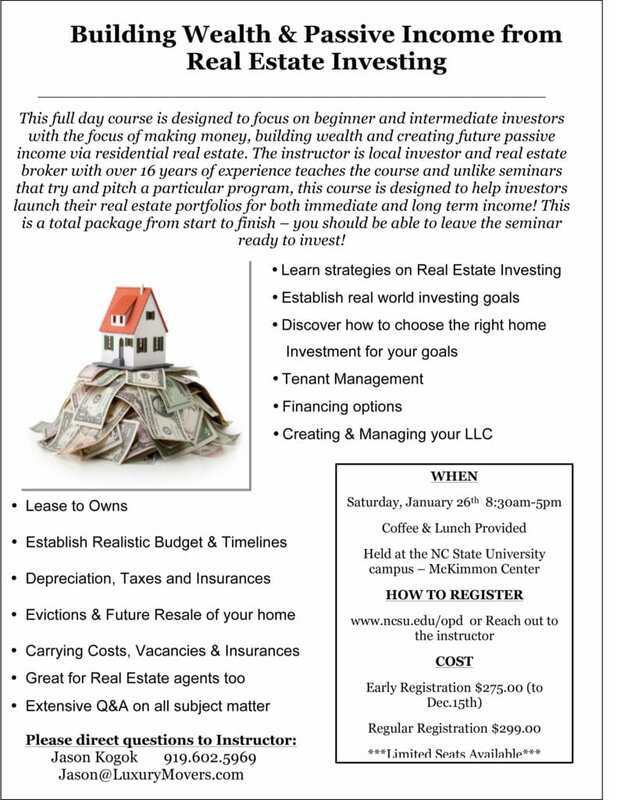 This course, designed for novice to intermediate investors who are looking to start or grow their investment portfolio, will thoroughly examine various real estate investment opportunities to build future wealth and passive income. This is a true, real-world course that will study real examples from the North Carolina real estate market. You will dive deep into rental homes in the local market as a way to build a portfolio–from the initial setting of goals to financing the property; through budgets, cash flows, depreciation, analysis of investments, and even taxes and future profit realization. Discussion will also go into LLCs and the set-up of those structures for real estate, along with insurances and evictions.